Blushhh Music is reaching for new sounds, new styling and is not afraid of making social connections. Coming out of Houston are three wonderful women who have no hesitation in letting you know that they have thrown their hats into the music game and have what it takes to make it. Blushhh Music is the new protégée of famed music manager Matthew Knowles, who was instrumental in guiding and strategizing the development and later success of the girl group “Destiny’s Child”. He was not only their manger, but also the father of the then lead singer Beyonce Knowles. The group consists of Sunni, Tali and Bunni Ray. 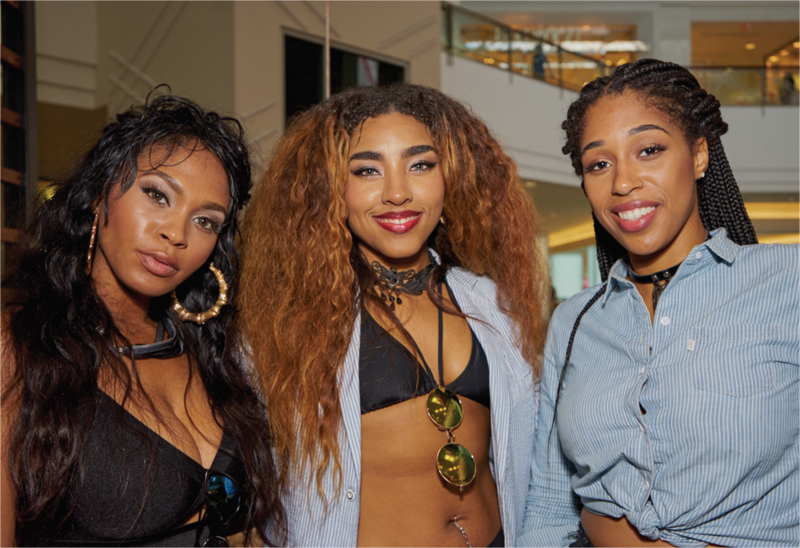 While performing around Houston trying to make a name for themselves the girls heard about a music showcase at Music World Entertainment where Knowles was providing feedback to artists. “’We got excited and eager to get in front of Mr. Knowles so we entered the showcase. On our first appearance at the showcase, he was not present. The feedback that we got was to try less rap and more singing,” shares Sunni. Toying with her drink glass on the lunch table, Sunni explained that they went back to the showcase and did a different song and that time it worked. With a gleeful smile Sunni says, “And that’s when Mr. Knowles came into the picture. We were trend setting but not as confident until we changed our style to two rappers and a singer. At the second performance, Mr. Knowles made some suggestions and we happily implemented them. We saw value in his feedback. After our performance, we stopped off at Starbucks. While there, we receive a call. He wanted to see us again. We hastily drove back to the showcase and sang acapella for him. He listened intently, and at the end he muttered, ‘I would like to sign you guys’”. They signed with Knowles and went into artist development. Six months later, Bunni Ray joined the group.”One member left the group so we did a post on Instagram looking for a new member, Bunni answered and the rest is history,” says Sunni. They met, the girls played some of their music for her, and it was on. From that point, it was awesome. “I automatically took the jump, as this is something that I always wanted to do. I was in school at that time but I knew that this is where I wanted to be. My father wanted me to finish school, but he also did not want me to miss a once in a lifetime opportunity,” says Bunni. When asked where her confidence came from, Bunni took a moment, then said, “I did stuff locally but did not have that confidence in my craft. My confidence grew after meeting with Sunni, Tali and Mr. Knowles. I saw myself in the role. I was able to visualize this and it was the perfect platform. After meeting up with these guys, I got home to my bedroom and felt so excited. My audition was a secret and I had a two-week trial in which I was up against another girl. When I got the call back saying that I was in the group I got emotional and tearful. My mom was driving and I was in the car with her, I began screaming my head off. My mom was like, ‘oh my God, this is amazing’. My Dad was set on me finishing school, but in the end he said, “Follow your dreams; it would make me happy to see you succeed in your dreams”. With all the pieces In place, the big question is what’s next for the trio. Is this the beginning of the next big girl’s group? Says Sunni, “Being in this moment is definitely a good feeling. It is not perfect but we are enjoying it. Quite often things turn out differently from the way that we visualize, but we are glad about the way that it is working out. Small Business Resolution: Make More Money And Do Less Work … Here’s How!